Top Engineering colleges in Palwal, list of best ranking private, government colleges in Palwal. Colleges offering courses B. tech and M. tech in Palwal.Admission alerts, Fee Structures of engineering colleges in Palwal. 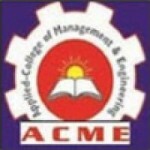 Applied College of Management and Engineering is a self financed institute managed and run by PRS Education & Research Foundation.